With the help of Executive Chef Robert Ash, Omni Orlando Resort is setting a pretty high standard in the world of fine and sustainable dining. Since coming aboard with Omni Orlando, Chef Ash has been successful in designing a menu that has no boundaries or nationalities. His commitment to excellence and his more than seventeen years in the culinary field are what drives Chef Ash not only to excellence, but to always challenge the complexity of tastes and the depth of the palate. His new mission is creating a monthly additional feature menu that includes the "Item Of The Month." The item of the month menu showcases locally sourced foods that highlight one locally sourced ingredient each month. The new menu features ingredients from local farmers, fisherman, ranchers, and foragers and is based on using that particular ingredient in its peak season in a variety of ways. For the month of June, Corn is the item of the month and Chef Ash and his team have created five specials to show how diverse corn can be. All the corn used to create the menu is from Long and Scott Farms in Mt. Dora. For July, the item of the month is shrimp from some of the best paces in Florida like Jacksonville, Key West and the Gulf Coast. On my recent visit to sample the "Item of the Month" we were treated to a wonderful dinner service at David's Club. Omni Orlando has a few places to grab some food, but the resorts two main restaurants are Trevi's and Davids Club. Trevi's is an Italian restaurant that features a brick oven and family style menu ordering options. Both restaurants are participating in the Item of the month program and feature the same ingredient used for that month. 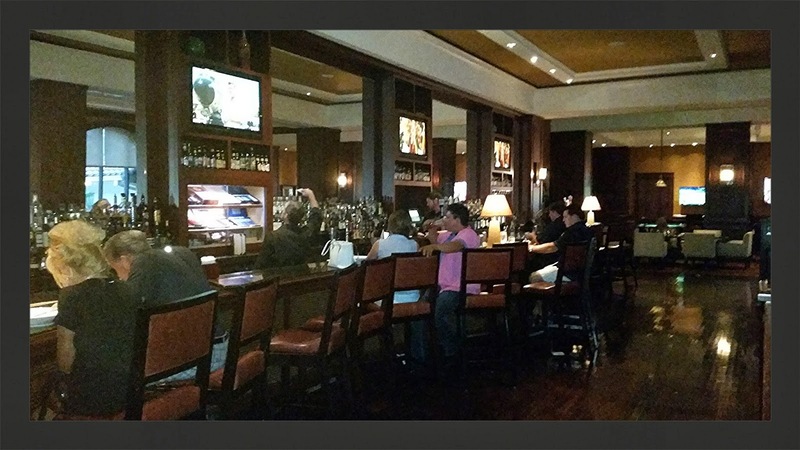 Davids Club is an upscale sports bar and grill that serves hand cut steaks, short ribs, sandwiches, and a selection of premium cigars and Cognacs. In addition to those fine Cognacs, David's also has an impressive list of premium Scotch and specialty cocktails. If wine or beer is your fancy, they also have a small craft beer selection and a decent wine list. 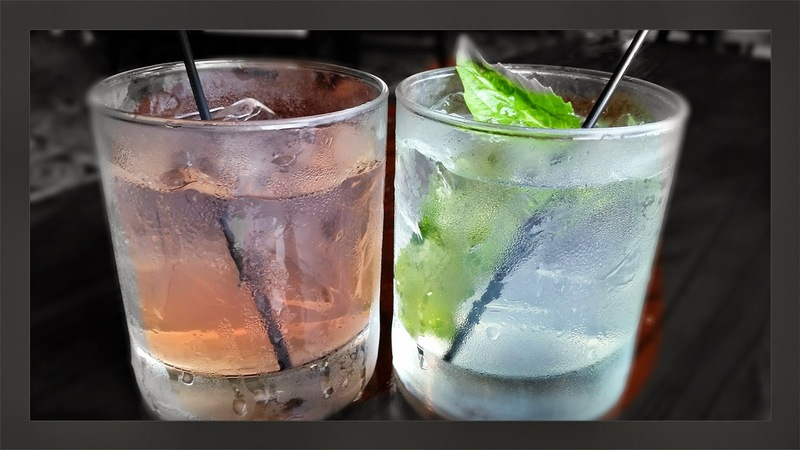 We really enjoyed the flavors and the refreshing qualities of cocktails like the Knickerbocker, Basil Peach Gimlet and the Blushing Berri. 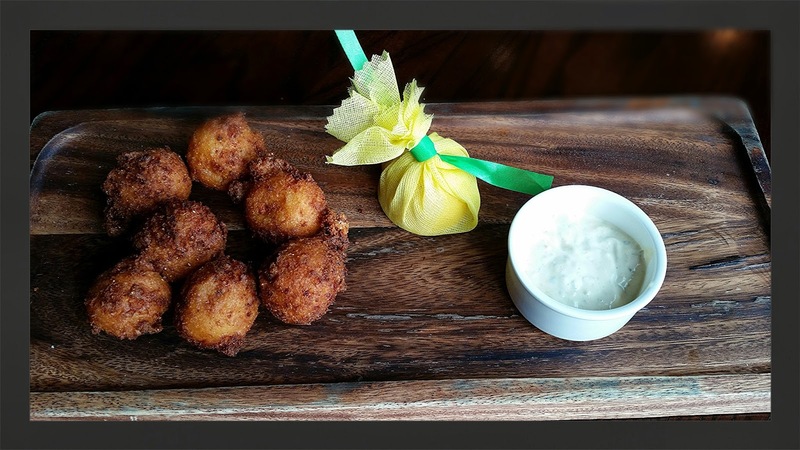 To get our Item Of The Month Menu started, Chef Ash treated us to a serving of some pretty darn good Hushpuppies. These are not your average Hushpuppies by a long shot as they are made with smoked Gouda cheese and Nueske’s cherrywood bacon. Our next appetizer was the Corn Crepes. It may sound strange to make a crepe like concoction out of corn, but it actually tasted wonderful. 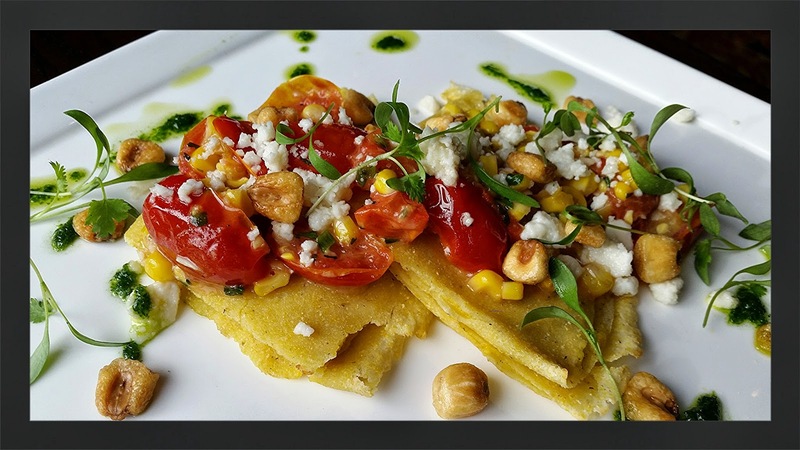 The corn crepes were topped with a grilled corn and tomato salad, quseo fresco, corn nuts, and a lemon vinaigrette. The flavors worked wonderfully together and I enjoyed the added texture of the corn nuts. The Shrimp 'n Grits became an instant favorite. The grits are made with cheese and topped with Cajun BBQ shrimp and a corn salsa. For some reason, as southern as Florida is, its hard to find good grits. The grits served in this dish were some of the most authentic and home style that I have had in any restaurant, and we found ourselves licking the bowl. Our second entree was the Chicken and Waffles with sriracha maple syrup. 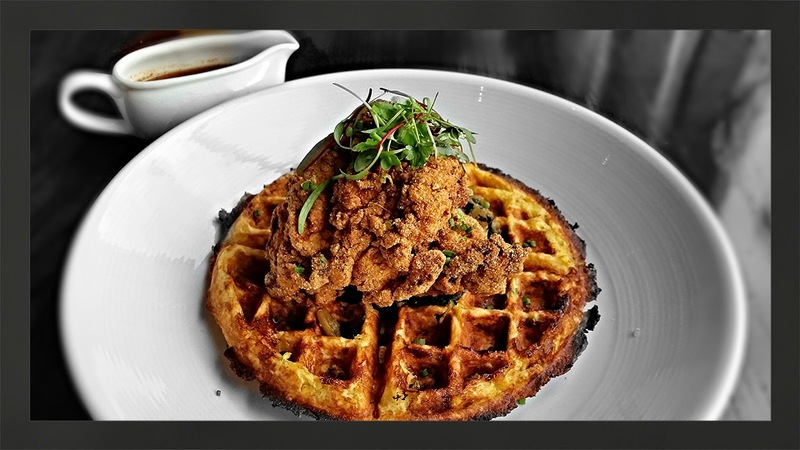 The chicken is coated in a corn meal crust and the waffle is made out of a cheddar and jalapeno cornmeal mixture. Usually adding all of those corn ingredients together can make for dry tasting foods, but the chicken was very tender and juicy and the waffle was firm, but light. I really enjoyed the sriracha maple syrup as well and thought it added a little extra kick to the meal overall. 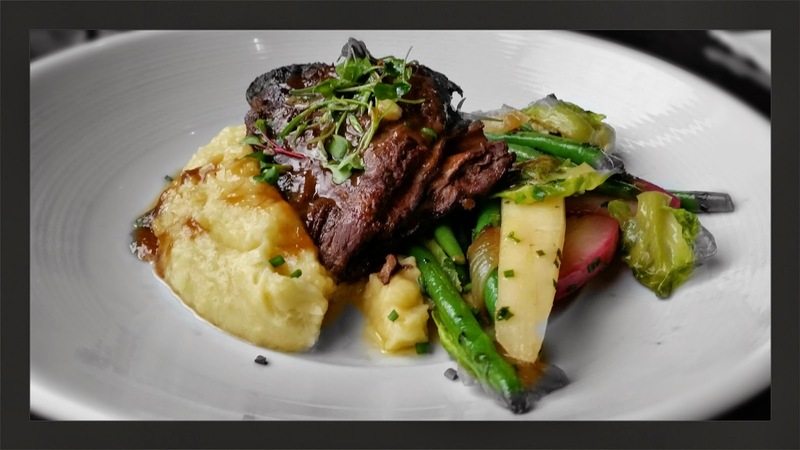 Thanks to our great server Maria, we were able to try the house specialty Short Rib. Although its not part of the item of the month menu, this was a spectacular short rib that melted in your mouth. To finish our evening off on a sweet note we had the final of the five "Items Of The Month" which is simply called Corn Cake. The name may be simple, but this desert had a complex variety of ingredients. 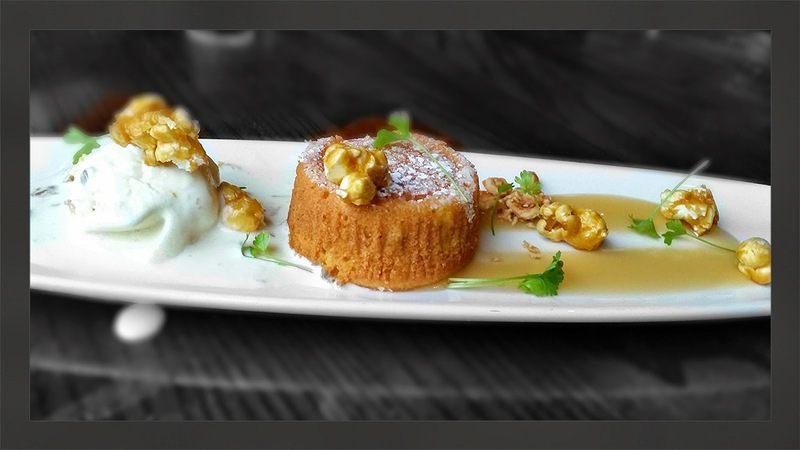 The corn cake itself is made of sweet cornbread and the ice cream is made with bacon and sweet corn and then topped off with caramel corn and a bacon infused syrup. Once again this dish took ordinary ingredients and transformed them into a wonderful and tasty treat. That's the genius of Chef Ash...taking simplicity and making it extraordinary. We had a great time visiting Omni Orlando and really enjoyed our meal at David's Club. 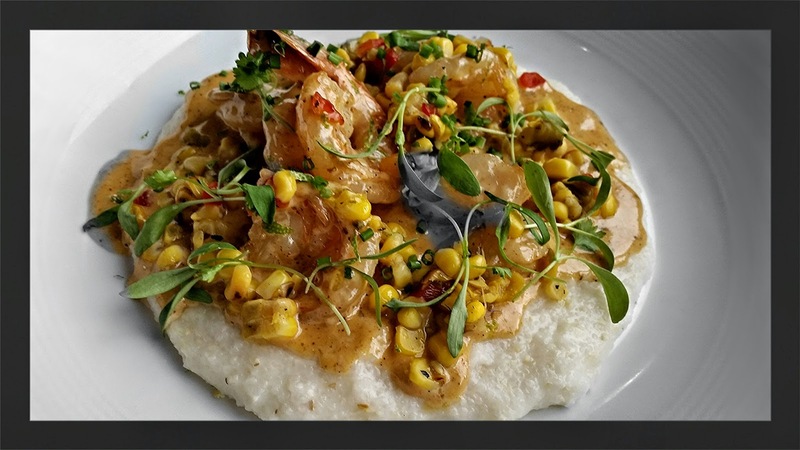 The Item of The Month menu was pretty impressive and we cant wait to see what Chef Ash is going to do with the July ingredient of fresh Florida shrimp. You can be sure that both David's Club and Trevi’s are going to create some amazing and unique dishes using locally harvested ingredients that will challenge your palate to new tastes. 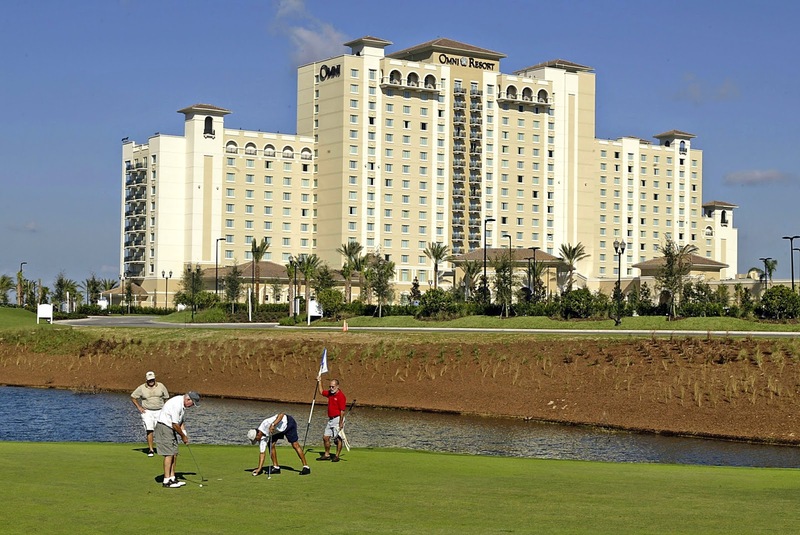 Whether you are an Orlando local, or are from out of town and looking for a fun place to stay, Omni Orlando Resort at Champions Gate should be on the top of your list. Omni Orlando is a Four Diamond resort that is located minutes away from the Orlando attractions, yet worlds away from all the distractions.